My brother recently mentioned having made tempura-style orange chicken, which led me to look online to find out what exactly tempura was, since I’d not to my knowledge had it before. I learned that tempura is Portuguese-inspired Japanese, foods fried in a very thin batter coating. I recently tried a batter coating for strips of chicken and ended up replicating, except for having seasoned the batter, Chinese restaurant chicken fingers. The kids loved it, and I figured the batter was a way to stretch the limited amount of chicken. Usually tempura is made with eggs, flour and cold water. The cold matters to the chemistry, much the way hot presumably mattered in my recent test of a faster flour tortilla recipe. The egg apparently doesn’t, because I found it is possible to make tempura without it. I’ve learned that the best way to arrive at recipes or adaptable inspirations for dishes that contain no dairy and no eggs is to include “vegan” in the search. It seemed kind of odd to search for vegan tempura, but in addition to its most common use in seafood, tempura is also used for vegetables, which I look forward to trying. I’ve had that kind of thing in a restaurant, if not by that name, with cauliflower, squash and broccoli. A little oil – maybe a tablespoon or so. Season as desired or not at all. I used a bit of red pepper, a dash or so of garlic powder, and a bit of black pepper. I deiviated from strictly tempura by crumbling some Ritz crackers fairly fine and dipping one side of most of the pieces of chicken in it. I also considered using oatmeal similarly. No deep fryer here. Enough oil in a frying pan, nice and hot, to be able to cook one side then turn it over. I cut the chicken into very small strips and chunks, the better to cook fast and go with the lightness of the batter. 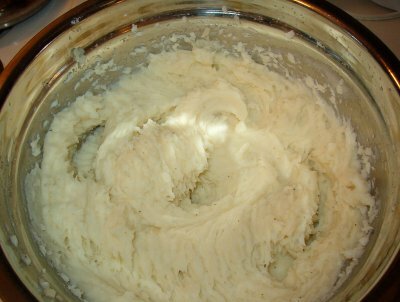 I put the dry ingredients in a bowl and mixed them together with a whisk. Then I poured in the water and oil. Started with half the water and mixed, then the rest. You might watch how it seems and back off or add to the amount of water. Stirred it thoroughly. It bubbled a little and looked a lot like pancake batter. I ended up just drowning all the pieces of chicken in the batter, pulling each one out and putting them in the pan one at a time in two batches. I ended up frying a small patty of batter and crumbs from the batter that was left on the crumb plate. That was yummy and suggests possibilities. This is very much a keeper. We inhaled it. On one of the recipes I saw for vegetable tempura, it said serve and eat immediately lest the batter get soggy. With the chicken I’d also say eat it sooner than later, because it isn’t as good in texture after it sits a while. Tastes good though. The vegetable tempura recipe also said dredge in flour before dipping in batter. I can see that being useful for veggies. Chicken worked without. Would it have worked better with? Not sure. Since I have never had tempura in a restaurant, and in fact the only Japanese restaurant food I’ve had is noodles, I can’t compare. Even if it’s not “real tempura,” it’s so good I can’t wait ti try it again. I’m thinking about making flour tortillas and went back to look at the recipe with a critical eye, thinking there was a wait time involved. Sure enough, it was 3:00 when I started looking it up, and from kneaded it calls for at least 3 hours on the counter before forming into balls, rolling and cooking. I thought I might do it anyway, being at a loss for what to make if not burritos, but decided to look up other recipes to see if the wait is a universal. For a moment I thought she was going to say put the little balls in the fridge, or let them sit out, but nope… immediate gratification. What is fascinating about this video and at least one written recipe I saw is that they call for baking powder. Our recipe does not. I have to wonder if that makes the difference. At any rate, great, fast video, different technique than you’ve seen here in our traditional recipe and method. My burriot plans would appear to be saved. It’s at least worth a try, to see how they come out. Perhaps I’ll update later with results. They were easy to make and it worked basically as advertised. It was convenient, doing them so quickly. It made about 16 smallish tortillas and only 2 remain. However…. They don’t taste nearly as good as the recipe that leaves out the baking powder but has a 3 hour rest time. I’d love to come up with a happy medium, where they are faster and easy to work with – these seemed to roll out better, though weather conditions favored it – while also being as tasty. Once upon a time, Deb posted her mother’s flour tortilla recipe at our former joint/family/anything blog, Accidental Verbosity, before moving to Blogblivion. We eat these fairly regularly, and once etsimated the cost for perhaps 16 of them at under 40 cents, versus, say, $1.69 for a pack of 8 commercial ones. You pay to save time and effort and get uniformity, but even Manny’s brand isn’t as good as homemade. It probably costs more now, given the recent increases in grocery costs and particularly, we just noticed on having to replace an empty, Crisco. That resulted in buying store brand soy/cottonseed shortening comparable to the current Crisco formulation. Traditionally one would use lard, which Deb almost got me as it was available and inexpensive. Definitely have to try that sometime. This is a repost and, because it wasn’t written by me, guest recipe, inspired because I recently started making these myself, and found that the recipe was harder to find searching than it ought have been. I realized I’d started a food and cooking blog but never posted this here. Duh. We’ve been experimenting with different things to do with flour tortillas ever since we finally got around to trying my mother’s recipe for them. She used to make these often when I was a kid, since they’re better and cheaper than store-bought (and, I believe, because at the time it was tough to get even a passable grocery-store tortilla in rural Minnesota, a situation that has since changed). She taught some of the other women in the neighborhood how to make them, too, and they’ve been a hit with all who have tried them. Dissolve salt in water and set aside. Rub shortening into flour with fingertips. (I’ve got the warehouse-club-sized can of shortening, so I meaure it into a cup then divide it as I add it to the flour…instead of a single lump, little spoonfuls. Works just as well…the point is to have it in small pieces so it’s easier to rub into the flour.) Gradually add salt water to flour mixture. (The trick here is getting the flour/water ratio right so the dough is smooth rather than sticky or flour-y. I always seem to need a tablespoon more water or flour to make it just right, depending on how perfectly I’ve measured and the weather that day.) Knead well. Set aside covered for a minimum of three hours (I wrap it in plastic wrap, to keep the dough from getting a “skin,” then toss it back in the bowl and cover with a towel.). Knead again. Divide into 1 & 1/2 inch portions and roll out on floured board. (I shape the dough into a cylinder, then cut off the appropriate portion for the size I want for each tortilla. Usually takes me a test tortilla or two to get it right. The best part of that is that the mistakes are so tasty…yum. I also roll them out right on my countertop…a board is certainly not required, unless you have tile. *grin* The dough should be good and stretchy and a bit of a pain to roll out, and tends to shrink slightly when transferred to the pan, so roll ‘em thin.) Cook each on a hot griddle/frying pan until it bubbles and browns slightly. Makes anywhere from 12 to 18 tortillas, depending on size, thickness, and how many get eaten along the way. As for what we’ve done with them…we’ve made burritos and quesadillas and even chicken and veggie wraps in the last couple of weeks, and I have no doubt some of the turkey will find it’s way into them in one form or another. Very versatile and very, very yummy. The first time I made these, I became the official tortilla maker, they came out so well. The directions above say knead again after the dough sits at least three hours. Turns out that Deb didn’t actually do that when she made them. I did it minimally at best. It doesn’t seem to hurt them and anecdotally may be better, though certainly if the dough needs a little extra to get the texture feeling better while making it into cylinders. I use one of those Pyrex cups that has lines up to a cup but room to add an extra quarter cup by eye. I microwave cold water a minute or 90 seconds, stir in the half tablespoon of salt to dissolve, and set it aside. I’ve been using about a cup in practice. I make sure the flour is worked into the shortening extremely thoroughly. It’s somewhat like making pie crust, but without the objective of flaky. I flip them over and over while rolling, to hel combat the curling and get them thin enough. Basically it’s an easy easy thing to make. The big consideration is the sitting time for the dough. It’s fast compared to making bread. It’s even relatively fast to roll out, and I roll a couple then start cooking as I roll more. They are so useful and so cheap. We’ve had the challenge of a baby with food sensitivities that seem to be based around salicyslates, and these were a perfect introduction to wheat-based foods, which as expected don’t bother him. Being simple and homemade, I knew exactly what was in them. Not like, for instance, whoile wheat pasta that contains corn meal, which he can’t have. But I digress. Simple yet tasty. At lunch yesterday I had the kids by myself, so I thought about giving them tuna, despite Sadie’s “no!” when asked. That made me think of tuna melts to be different, especially given the presence of a chunk of sharp cheddar – almost too sharp – that the kids seem to love. 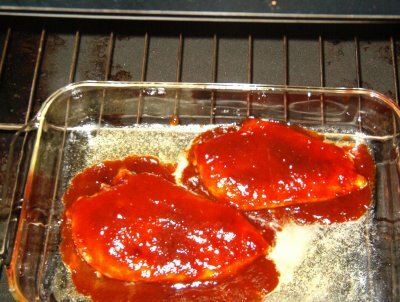 Then I remembered a boneless chicken breast with sweet barbecue sauce I had leftover from the oven a couple days ago. I sliced that thin, across the grain, and laid it out on two slices of bread in the toaster oven tray. I topped it with large crumbs of sharp cheddar, not covering it completely, as with slices or a coherent layer of shredded cheese, though YMMV. In it went for a top brown cycle. With tuna I’d often do part of a second top brown cycle to make the cheese especially melty and bubbly, but for the chicken that was enough. It was delicious. A shame the kids weren’t enthusiastic, distracted instead by the Terra vegetable chips I noticed we had and served with it. Speaking of unexpectedly tasty things that perhaps shouldn’t work, but do. Sadie wouldn’t eat hers but guarded it with her life. I ate half of Valerie’s, and she did eat most of the rest. Anyway, it turned out to be a cool thing to do with leftover chicken. This is a repost from Blogblivion, posted here back in November. A few days ago, after an extended break, I made beef stew again, using my big stock pot and about 2 1/3 lbs of $1.59 “London broil” steak cut up small. I started with a hunk of butter, melted in the bottom of the pot, with the majority of a large, sweet onion chopped and sauteed in it, starting to add seasoning, especially a mess of celery flakes. Then I added the meat and cooked it most of the way through, stirring in more seasoning. Ultimately the main thing was you could really taste the beef and peas, and a bit too much black pepper, but we ate it for four meals. The enthusiastic reception was a combo of it was especially good, the right weather, and completely unexpected. I didn’t have any real garlic, so just used some powder. I was limited in frozen veggies, so it got a lot of peas and some traditional frozen mixed veggies to add variety. 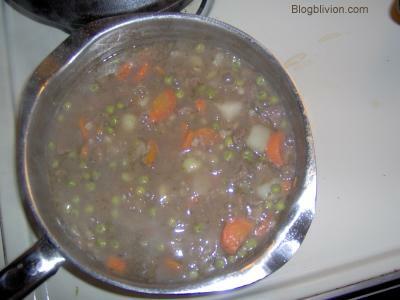 It could be enough to have the potato, barley, carrot and onion, but adding at least the peas really adds something. Yesterday I made what we have dubbed barley beef stew, based on a recipe for beef & vegetable barley soup on the Goya barley package. I had a pound or so of top round steak in the freezer, left from a 2 piece, 2.44 lb package I bought recently for an astonishing $1.89/lb. 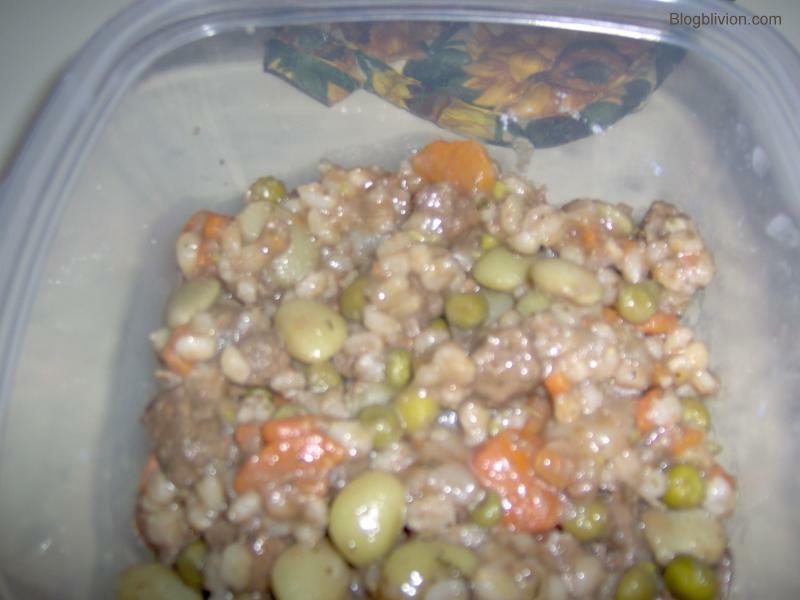 Their recipe calls for beef, barley, onion, garlic, spices, boullion, water, and a can of mixed vegetables. We wanted something thicker, and would be using frozen or fresh vegetables, but I par-cooked the fresh ones based on the idea that precooked would go into the recipe as written. I could probably have just put the fresh veggies in right after adding the water. Other spices to taste, in pinches or more, including but not limited to black pepper, red pepper, cumin, savory, parsley, fennel seed. Heat the oil in a saucepan and brown the beef. For me it was more of a medium pan, too deep to really brown and just cooked and bled water, which I boiled off as much of as I could. Stir in onion and garlic and cook until onion tenderizes. Stir in oregano, bay leaf, celery salt or seed, boullion cubes and water. Other spices can go now, later or both. Bring to boil, then reduce heat and simmer. Original called for an hour, but I cut it short by at least 10 minutes. I put in part of the carrot and potato at start of simmer and the rest maybe half an hour in. I’d probably not par cook them next time and put them in at or near the start. Add barley and frozen (or canned or precooked) vegetables. Cook over medium to low heat another 30 minutes. It was right before or during the last step I added black pepper, about 3 fennel seeds, and a dash of extra oregano. Anyway, it was the tastiest beef stew or soup I have ever had. I started tasting the beef when it was first fully cooked and it was divine. 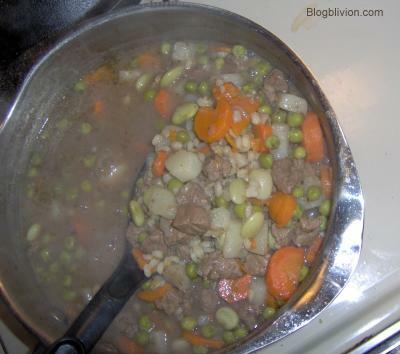 It reminded me of my late grandfather’s beef stew when it was “on,” maybe a little more flavored. My grandmother is a great cook, but beef stew was one of his specialties. It actually got weaker later on, which, along with thinking it had too much bay leaf flavor, was what inspired me to touch up the flavorings. I also had to add water when I added the barley and frozen veggies. I should note that the barley could have gone in sooner, and actually finished absorbing water and cooking after the heat was off, as it was quite a while before we ate more than a sampling. Deb said I’d outdone myself, and has claimed the lefover bowl of it for Mars herself. It made four solid bowls worth, and we estimated it at IIRC about 440 calories each, loaded with nutrients and fiber. Pictures? Why yes, we have them. This is after I’d added the veggies, barley and more water. In the first one it looks deceptively watery, but the second one shows just how thick it was in the pan. The picture below is the leftovers, showing how thick it became after the barley finished. I thought it would be perfect to serve on and with injera (which even if I never try making an Ethiopian dish, I have a reason to try making now). We had wheat bread and butter, which is more traditional. Sadie was being bird-like, but Valerie couldn’t get enough of it. 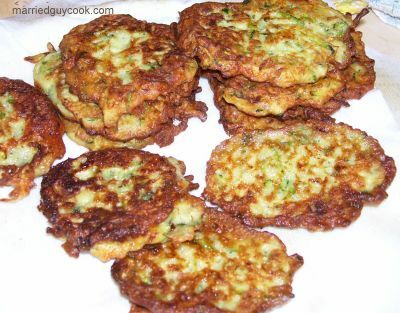 I partially answered my own squash question, finding a ton of zucchini recipes online. So when I turned off the computer in deference to thunderstorms yesterday afternoon, I started experimenting ahead of when I would otherwise have started making supper. 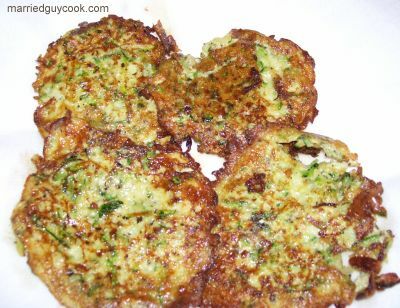 I decided to try making zucchini fritters, using two of the five at the linked page. I didn’t use any of these recipes, but I was intrigued by the pancakes, faux crab cakes, and Lucky Olive’s Zucchini ideas there. I don’t have any Old Bay seasoning, nor having I smelled or tasted it to my knowledge, so I’d have to wing it, combining the seasonings that are, in some proportion, a part of Old Bay. Which already sounds like something I’d come up with, except I seldom use the dry mustard in anything but Laurie’s Spicy Chicken (which I may as well repost here, if Google is going to have such an insanely hard time locating the post). I also thought zucchini enchiladas sounded intriguing, though it intrigued me as much that it didn’t call for canned enchilada sauce, and could presumably be adapted to chicken, or a mix of chicken and veggie. Anyway, I was mainly focused on the 4th fritter recipe, but I was intrigued by the 2nd one, as anything that calls for mint is so rare in my experience. 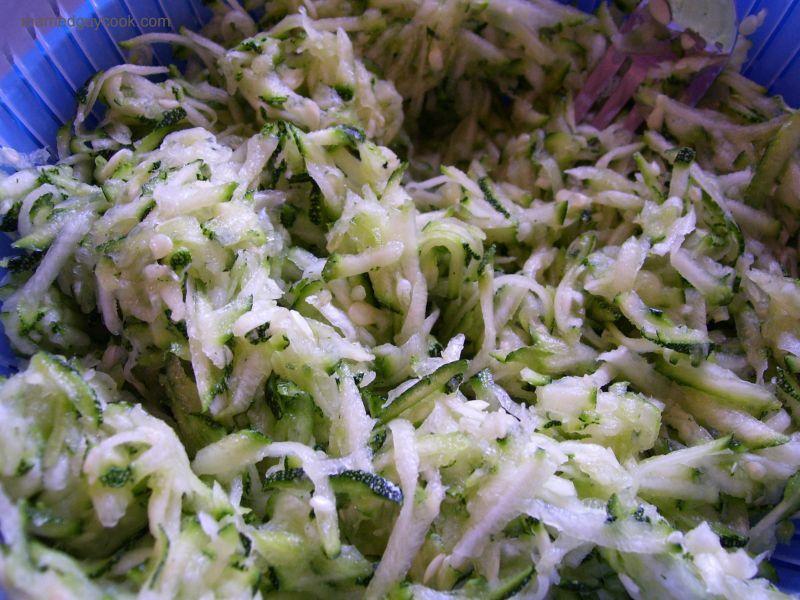 Place zucchini in colander; let drain 1 hour. In a large bowl, with a wire whisk, beat the eggs until they’re frothy. Add remaining ingredients; whisk until blended. Stir in the zucchini, 1/2 teaspoon salt and 1/4 teaspoon freshly ground pepper. Preheat oven to 200ÂºF. In large skillet, over medium to high heat, heat 2 tablespoons salad oil. Spoon in fritters batter, using 1 tablespoon butter for each fritter, adding more oil as necessary. Cook 1 minute on each side, until golden brown. Keep warm, covered with aluminum foil, on platter in oven until ready to serve. Makes 6 servings. First annotation, the flour; this seems to be too little. My proportions were off because I used one cup of zucchini but used a whole rather large egg, but if you compare to the later recipe, the minimalist amount of flour makes little sense. They came out almost custardy, with kind of a soggy texture. The mint flavor went poorly. It would be better simply to steam, boil, even roast or bake zucchini with mint. I grated one zucchini, resulting in 3 1/3 cups to use. As noted, I decided to use a cup for the mint variant, interpreting 2+ cups as about right for the garlic, oregano and parm variant. Though in reality what I grated was little more than a medium zucchini, so you could interpret the second recipe as saying to use five or six cups. The grated zucchini went into a collander that nested into a bowl so it could shed liquid, and I mixed in a fair amount of salt to aid that process, letting it sit quite a while. Anyway, I beat an egg, added and beat in maybe a tablespoon of milk, a teaspoon of flour, a couple dashes of black pepper, and near half a teaspoon of dried mint. Flour by the teaspoon? Still sounds weird to me. Then I mixed in the zucchini thoroughly. I used olive oil for frying; not very deep. One lesson is they could have used more oil. That second annotation I realized, after momentary confusion, that it was a typo of batter. It’s not saying to add a tablespoon of butter for each fritter. The modified recipe made four, nice and neat. They were thinner and runnier than the later ones, and I was surprised while they were still cooking as they seemed hesitant to get crispy. Getting Deb to eat zucchini is mainly about texture. That they came out like custard was no help, given that she disliked custard due to its texture. You could eat them and live, but they were weird. I snacked down about one and a half, including a small piece I gave Sadie that sadly made her uninterested in trying the other kind later. She made a face and discarded it. Not recommended. But I’d still love some ideas on what to make using mint, since I have a jar of it on the spice rack. Combine and mix all ingredients. Mixture will be the consistency of pancake batter. Drop by tablespoonfuls into hot oil and fry until golden brown. Drain on paper towels. I had two cups and a fraction of shredded zucchini, as mentioned, and I decided to treat that as the quantity correct for the recipe. Who’s to say what “medium” means, after all. The other ingredients followed along, except it was parmesan and romano, rather than straight parm, and I used a little extra, and the clove of garlic was fairly large. I also added a dribble of extra water when I couldn’t even mix the batter, it was so thick. I scoffed at the “consistency of pancake batter” part, but it was, for relatively thick values of pancake batter. The moisture in the zucchini saw to that. I made the oil deeper for these, and they tended to be thicker. Used slightly higher heat and made sure they were cooked as crisp as could be expected. Valerie ate three of the twelve the recipe made. Sadie didn’t try them. I thought they were tasty, maybe a bit strong on the garlic, but strong as it was, the oregano flavor shone through too. 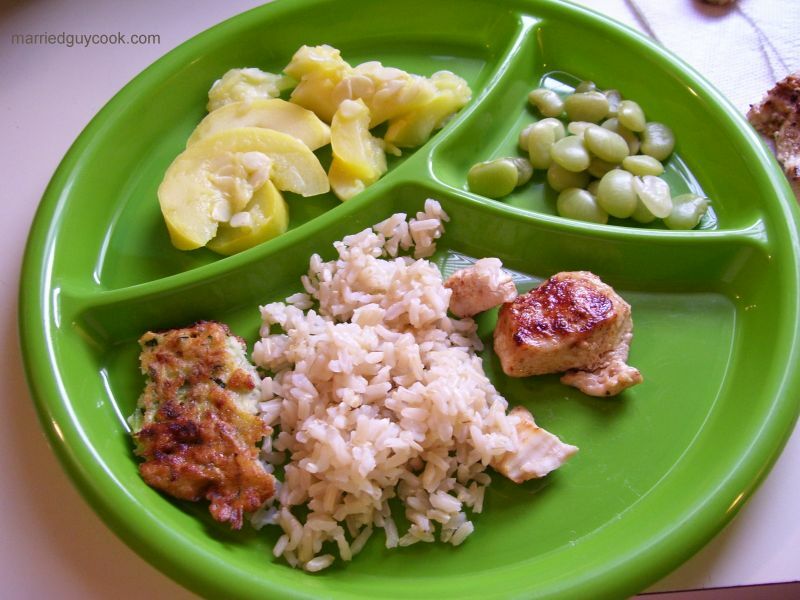 We ate all twelve before and during dinner, despite having chicken, rice, summer squash and lima beans too. I cooked the chicken in the same oil, figuring the flavor infused from the fritters would be a good base. I added a touch of garlic powder, red pepper, generous paprika, dash of ginger, celery salt, pinch of oregano, and some Italian seasoning. It was one of the tastiest batches of random chicken I’ve ever made. I keep forgetting; I have pictures. 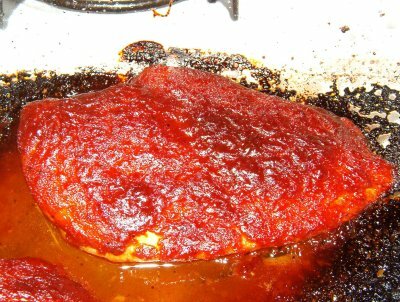 My stepsister used to make a hot red sauce baked on top of chicken breasts, usually as a treat for her less kitchen comfy cousin, and once for me when we were both at my father’s house in Vermont. It was so good, I always remembered it fondly and wanted the recipe. 1/3 cup ketchup, 1 TBLS W’shire Sauce, black and cayenne pepper to taste, dry mustard, Brown sugar (she said she sometimes used twin B. sugar) and a little apple cider vinegar. Says these are all the ingredients which as you can see its by taste. Cook until slightly reduced. I would think you could dble this as it does [not] make very much. This would work for 3 breasts, or heavy on 2 breasts. This is extremely hot as measured here, and could be done lighter on both kinds of pepper to soften the impact. Everything is somewhat flexible, beyond that, to taste. 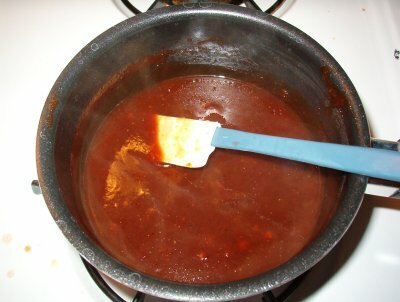 Combine the spices, ketchup, worcestershire, brown sugar, and vinegar. I ended up using water to help flush as much as possible out of the measuring cup I mixed it all in, when transferring to a small saucepan. It gets cooked down either way. I was tasting as I went along, adding brown sugar after it was in the pan. Stir regularly while cooking over low heat. Preheat oven. I would estimate 400 degrees throughout to be appropriate, though I started at 450. I put butter in an appropriately sized Pyrex pan and let it melt in the bottom before taking the pan back out. This was on the theory I needed something greasing the pan, and everything is better with butter. It would probably work fine with spray or even nothing. Place the chicken in the baking pan. Cover top of each piece more or less evenly with sauce. Bake until done, perhaps 25 – 30 minutes at 400. It was amazingly good; a bit on the hot side for Deb, perfect to bordering on excessive for me.